Jane entered Reception with a specific speech and language impairment. She comprehended well but she had a severe expressive language delay. She was able to articulate (intelligibly) about 30 words and the rest of the words she attempted began with the sound /g/. She also used some Makaton signing, natural gesture, facial expression as well as pointing to communicate. The signing was not always successful because of difficulties with fine motor control. Despite this she managed to communicate competently with peers using a combination of the above. In June 2007, a target was set for Jane to be able to articulate the sound /b/ in consonant-vowel syllables. It was agreed to produce materials using Communicate: In Print to use within a language group (7 children, 3 adults) - the initial focus to be the sound /b/. This sound was chosen because it is a bi-labial sound (both lips touch each other) which is developmentally easier to produce as the child can easily imitate the movement. Initially a symbol supported story book was created about a monkey called Boo. A soft toy was found to represent Boo as a real object. This gave a greater impact to the activity. The focus was words with the initial sound /b/ - ball, bag, bed, bike, beach etc. 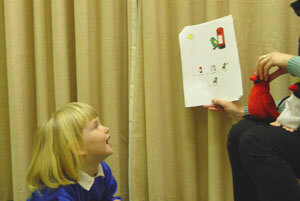 The story was read to pupils, including Jane, in a twice weekly language group with sessions over a term. Boo, the soft toy, was designated as Jane's special friend, helping her to articulate the sound, using the adult model and the symbol/word link. Activities using flashcards in a box, or laid out on the floor with a spinner were played to reinforce the vocabulary. 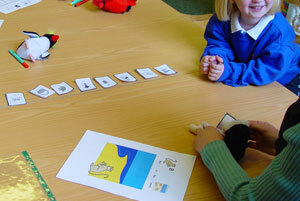 These were used in group and individual sessions to further reinforce the work of the Language Group. Jane also took the story home so her parents were able to read it with her. A second symbolised story was then made specifically for Jane, where she was in the story. Her photograph was inserted into the text. She loved taking this home to share with her family. This time two word phrases were used to encourage her language development e.g. big ball, blue bear. The rest of the children from the language group were so excited about the story, that they asked for a story to be produced which included their photos. Initially Jane's attention wandered in the Language Group, but this soon changed once the resources were introduced and she became more motivated to join in. After half a term she was able to say the /b/ sound in isolation and within 8 weeks she started to use it at the beginning of words with minor prompts. Finally after a term she was using /b/ unprompted in words such as 'boo', 'bye.' Her self esteem was greatly improved as a result of her success. Work will continue to encourage her to be able to say other sounds. Resources have now been made for the sounds /p/, /d/ and /t/, /g/ and /k/ and /s/ and /z/.